March 21 is Harmony Day in Australia. Harmony Day promotes the benefits of cultural diversity and celebrates Australia's cohesiveness and inclusivity. The continuing message of Harmony Day is ‘Everyone Belongs’. It's about community participation, inclusiveness, respect and a sense of belonging for everyone. In 2010, the theme was "express yourself", probably two of my most favourite words in the English language. By encouraging our kids to express themselves, we are helping them develop their creative side and their communication skills. Whether they do this through dance, art, writing, sculpture, choreography, or building with toothpicks and marshmallows, what matters is all those wonderful opportunities for creative skill development. In 2017, the message is "everyone belongs". There are so many forces in the world right now trying to drive people apart, trying to build walls and create shackles. Let's reach out to others and celebrate diversity instead! There are lots of resources at the Harmony Day website to help you organise an event, or you might just decide to wing it. How great that there are loads of curriculum-related Primary resources on Australia's Harmony Day website - like discussion topics, lesson ideas, crossword puzzles, lesson plans, art, science, history activities and more. There are some extra craft and art activities to keep kids involved on Harmony Day, like fortune tellers (“clickers-clack”) and you’ll also find Early Years resources. I truly believe that respect and acceptance of all cultures comes from mutual understanding. As parents and teachers, one way we can promote this is by sharing great children's literature with our kids, the sorts of books that allow children to walk a mile in someone else's shoes. 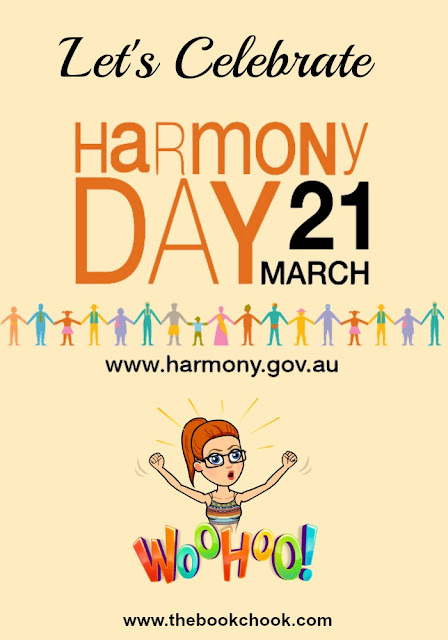 The Australian Red Cross has some suggested Harmony Day resources, including an app. This Pinterest board has some art/craft ideas. Travelling to different countries is not within everyone's budget, but how about travelling to different neighbourhoods? In a culturally diverse country like Australia, it's not difficult to find people whose clothes and customs are different from our own. Seeking out people from a range of cultures not only helps our kids become more tolerant and empathetic, it enriches all our lives. It seems to me Harmony Day is a perfect opportunity to indulge in a few of my favourite things - world music, art, conversation and great food! I can feel a party coming on. How about you? Any ideas for cultivating harmony within your family or neighbourhood? http://bit.ly/9NNC70 Latest post : Let's Celebrate Harmony - some ideas and resources on Harmony Day. That's great, Steph, glad to be of use. I love your blog! Harmon Day sounds wonderful! Teaching kids to express themselves and accept differences in others is so very important to their development! Thanks for sharing! Enjoyed your post. Both these ideas are key to the IB's PYP, of which I am a keen devotee! 'How we express ourselves' is one of our transdisiciplinary themes and open mindedness/ acceptance of other cultures is an integral part of the whole programme. I always enjoy your blog.. thanks! And very hard to test or measure, Marie! Ed, I know IB is International Baccalaureate but not sure of PYP. I would love to know more about IB's themes as it sounds my kind of programme! I love the idea of Harmony Day! "Express yourself" is a wonderful theme - we all are trying to find meaningful ways to do so. Creativity is important. So, as I was reading this post, I was pleasantly surprised to see that you mentioned my name and blog, and linked to my diversity/tolerance/global awareness category! Thank you so much, Susan. I agree that music, art, conversation, and food can really help cultivate harmony. So, I say we all spend the day enjoying these things. Oh, and it wouldn't hurt to throw in a little nature, too! It's the first day of spring tomorrow - and we're finally seeing the sun shine here in the northeastern USA after a long winter. It's time for a picnic! You are my go-to reference for lots of things Dawn, not least of which are your great book reviews. Here in my corner of the Southern hemisphere we are enjoying lovely autumn days - another great reason to party! Wonderful post! I've linked to it in my blog, and will spread the word among teachers here in North Carolina. We need a Harmony Day here! Hi Regina! Each year I plan to make it Harmony Day every day in my home but somehow that fails to eventuate. I believe just thinking about what harmony really means can benefit all of us. Great ideas, it is vital in this ever shrinking world that students have a good understanding of other cultures. Technology has been a big help to making this happen in the classroom.